Even people close to me are confused as to just how my thought process works. We can be having a conversation about low blood sugar and I'll interrupt with a comment on the cutest aviator glasses for Carter (true story). I know there's a method to my madness, but it isn't always apparent to others. So today I'm going to let you inside my mind for one brief, horrifying minute: Here's how you (okay, how I) get from apples to giraffes in 7 easy steps. Then I start wondering what that cord and bead combination would look like in the Hydrangea pattern, so I have to stop everything and make one up. 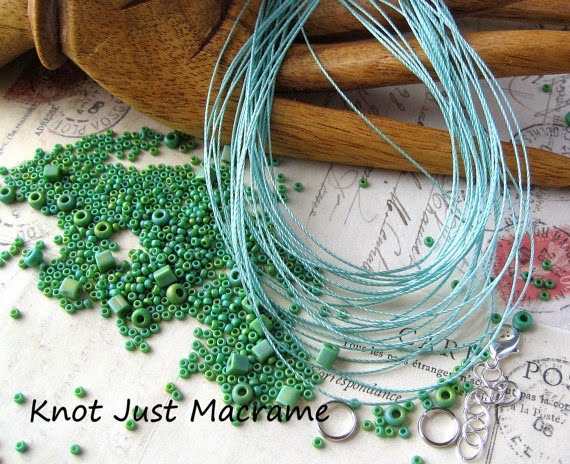 Which leads to trying the beads with a different color of cord. And then I wonder what would happen if I use some unexpected cord color. And before you know it, I'm mixing all the cord colors. Then I notice that the darker color makes little divisions of the flowers and the bracelet looks totally different. The flowers look more distinct and the diamond connectors almost disappear. And I wonder what would happen if I rearrange the cord colors. 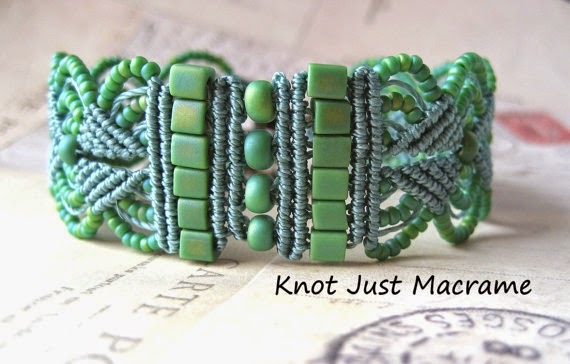 And then I notice all the texture in those bracelets and I wonder what would happen if I focus more on the knotting, but keep using the same cord colors and beads. Then I look up and it's three days later and we're out of milk. Oh, and somewhere in there I made up kits for the first three colorways and there are some earrings in these colors around here somewhere that I need to put on earwires and photograph. And that, my friends, is how you get from apples to giraffes in my world. So interesting and amazing what the least little change in cords can make. This is a great demonstration. This is a really good lesson in colors and oh, by the way, Apples to Giraffes. Thank you. What a great demonstration on how inspiration works! Thank you for sharing it. And those bracelets are all so beautiful. It all makes perfect sense to me - even the part where you're out of milk. They're all beautiful. Hi Sherri, I always enjoy reading about how other people are inspired and get from point A to point B. Thanx for sharing.